The recession has been the graveyard of many CEO reputations. So it may come as a welcome surprise that some leaders have not only survived but boosted their company’s performance the old-fashioned way-they earned it-through sticking to steady if unglamorous organic growth. Last February, a committee of his peers met at the NYSE and chose Jim Skinner, 64, CEO of McDonald’s, to be the 2009 Chief Executive of the Year for transforming an iconic brand by rebuilding its purpose, strengthening its internal talent and realigning that talent with a return to the company’s fundamental principles. In doing this, Skinner and his senior team had to rethink much of what had been proven successful since the days when founder Ray Kroc and his ideas suffused the organization. 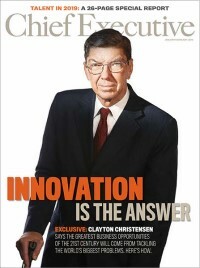 In November 2004, Skinner, who began his career with McDonald’s in 1971 as a trainee in Carpentersville, IL, became CEO at a critical time. Former CEO Jim Cantalupo had died of a heart attack earlier that year. His successor, Charlie Bell, was diagnosed with colon cancer and stepped down shortly after due to failing health. As he relates in the following interview with CE editor-inchief J.P. Donlon, Skinner felt his first order of business was to restore confidence and rethink direction. He had worked with Cantalupo and Bell to create a “Plan to Win” strategy, which called for jettisoning noncore businesses that proved a distraction for the company and concentrating on existing restaurants and franchisees. “We took our eyes off the fries,” Skinner drolly observes. Rather than growing as it had for 48 years by building new restaurants, the company focused on operating existing restaurants better. In addition, the company rethought its menu offerings, introducing more fruits, vegetables and chicken items into its traditional mix and delivering more nutrition information to help guide customers accordingly. Stung by criticism that McDonald’s and other fastfood groups contributed to growing obesity in America-the 2001 best seller Fast Food Nation and the 2004 documentary Super Size Me had tarnished the industry’s image-the company, under Skinner’s direction, also promoted physical activity programs for kids and adults and sponsored local youth sports teams. As a result, McDonald’s has been revitalized. The company was one of only two DJIA stocks that ended 2008 with a gain. (The other was Wal-Mart.) Last year it outperformed other restaurant competitors such as Burger King Holdings, Wendy’s International and Yum Brands, which operates Pizza Hut, Taco Bell and KFC. Since Skinner took the CEO job, McDonald’s total sales have increased from $50.1 billion in 2004 to $70.1 billion in 2008, up 41.1 percent. Net income increased by 81.3 percent, from $2.3 billion to $4.3 billion. Yet the total number of restaurants systemwide grew by a modest 4.8 percent, from 30,496 in 2004 to about 31,967 by year-end 2008. Average sales per restaurant jumped from $1.6 million to $2.2 million during this period, producing more cash flow for existing franchisees and more volume for suppliers. At a time when many companies are overleveraged to engineer growth, the Oak Brook, IL, firm maintains a strong credit rating. Realizing that McDonald’s, like any iconic brand company, is not recession proof, Skinner and his team are big believers in the system, provided the system continues to adapt. This is why 34 percent of McDonald’s restaurants in the U.S. are now open 24 hours a day. Since 2002, it has bought more chicken than beef worldwide. As part of a revitalization program, it’s introducing a number of sleek new restaurants with widescreen televisions and Wi-Fi connections. Alvarez cites other experiments, such as self-service kiosks where customers can order electronically. So far it’s working. Going forward, however, Skinner and his team are very much aware that they may need to guard against an even bigger challenge- overconfidence. (a) All results exclude the impact of impairment charges. (b) Growth rate is the compound annual growth rate rather than the 5-year average growth rate. What was behind McDonald’s change in its strategy when you became CEO? In 2002 we faced a terrible year-not the worst in our history but it was not good. Our stock price in the fourth quarter of ’02 ended up at an all-time low. Our brand was being attacked on many fronts and we were doing a lot of things to chase growth that were not specific to the core. By “core” I mean the McDonald’s branded restaurant customers. At the time, we had spent about $4.5 billion in the previous four years on new stores and we had zero incremental income growth. That was a formula for disaster over the long term and yet this is how our company grew for the previous 48 years. The goal was to open new restaurants and penetrate the world. We were in 118 countries and we were in every market where we were capable of having access to the world’s wealth. The strategy to grow by penetrating new markets or expand in the existing markets proved to yield diminishing returns. At the same time we were pursuing growth in other noncore brands, such as Boston Market, Chipotle and Pret a Manger, a sandwich chain in London where we had about a third ownership. We’re out of all those businesses now. Let me put this in context: By focusing on the core, 1 percent same store sales gain worldwide meant $500 million improvement, with $100 million going straight to the bottom line, as compared to new store openings, which weren’t coming out at the necessary rate. By the time they were accretive to the bottom line, it was clear we were better off focusing on existing restaurants. Today, the number is $600 million top line and $145 million on the bottom line. It was evident that we had to shift strategies to be better versus being bigger. We didn’t coin that phrase in 2003, that came later, but we knew we had to get back to the core. McDonald’s business model is a three-legged stool: franchisees, suppliers and company people. If any one leg-particularly the franchise leg-is not successful, as [founder] Ray Kroc said from the beginning, then we’re not successful. The way I look at the business is that if the franchisees make money all other things will be fine. Unfortunately, at the time our franchisees were disgruntled. They were accepting new restaurants even though it added an incremental $25,000 to $30,000 cash flow drain and demanded a lot more work. This made it important for us to retrench and revisit the business model that allowed us to be successful for the first 48 years. So we created two plans. One, to revitalize the financial side of the business we needed to cut new store growth to save capital. We cut new store openings from over 2,000 to about 200, more or less. Then we had to reduce the cost of doing business in the organization-the G&A. This required an attitude shift in the organization, a focus on being better at delivering to our customers in our restaurants and focusing on our existing restaurants, as compared to building new ones. This wasn’t easy to do because you couldn’t get a meeting around here without people talking about trying to get 4 or 5 percent top line growth from new stores. Forget about whether they were accretive or not. Second, we developed an operating plan to deliver a better experience for our customers. This was our “Plan to Win,” which was in itself not profound, but the alignment of the plan with our internal communication system was critical. We had to become our customers’ favorite place to eat and drink. To do this we developed the tenets-the five P’s [principles]- that animate our people. These relate to how to behave and what we have to do to deliver at the front counter and drive-through to improve the customer experience. Later, when we created the “i’m lovin’ it” campaign, we used it to build a framework to take the idea worldwide. And how has the strategy performed around the world? The beauty of it is that it is scalable wherever we place our bets. We’ll be somewhere around 2 percent growth overall-at one time we enjoyed 10 percent growth in emerging markets. Some countries are having tough economic times just like the U.S. but our business model continues to allow us to operate from a position of strength. We’re in these markets for the long haul. In China, for example, we’ll be opening 175 new restaurants and about 1,100 to 1,200 around the world. This will probably net 700 or so new locations after you factor for closings and relocations. So we should be close to 32,000 in total, systemwide. You took over after one CEO died and another was dying. With the company experiencing problems, people in the company must have been a bit disoriented. Yes. I was asked to take over in November  when people were wondering, “What happens now?” Remember, I was involved in developing the [“Plan to Win”] strategy in the first place. Keep in mind, anybody who knows McDonald’s and understands the system knows it’s not complicated. We’re in the restaurant business. You need to hire great people, train them, engage them and give them the freedom and tools to be able to deliver for the customers. With 32,000 locations around the world, you need to have a good team aligned with a solid plan, with very simple expectations about what needs to get done. My first goal was to set long-term growth. If you can’t do this, you won’t be around very long to have other objectives. I have a passion for talent management and leadership development to support sustainable growth. It’s my job to have the right people in the right place. At the time, we had good people, but we didn’t have the right operating people in the right places. The daily detailed diligence around running a great restaurant is hard to do. You come in the morning, you’ve got to clean the floors, get stocked up and have people ready to go. And you’ve got to do it every day. It’s not complicated. It’s not rocket science. But you need people who can embrace it. One of the elements that I brought to this is to institutionalize the alignment of talent, to get leaders to develop future leaders to take their job-people who can do it better than they could. Ralph [Alvarez, COO] and I review the top 150 people and see who’s being developed and what their individual development plans are. We have the Leadership Institute, which we’ve put some money behind in terms of taking our high potentials and further developing them so that they’re able to deliver on McDonald’s strategies-not to be just generalists. It’s not about just having smart people, because we have a lot of those around. Leaders need to be able to execute their strategies. I look for people who have experience and the capability to subordinate themselves to the McDonald’s system. It’s about rolling up your sleeves and being committed. You can be extremely bright, have gone to Harvard or Chicago Business School, but when it gets right down to it, you have to be committed to the restaurant business. A lot of people are going to take shots at you. “Oh, you work at McDonald’s,” they will say. Believe me, I have dealt with it my entire career. There is a little stigma there, because when most people think of McDonald’s they think of individual stores, not the system behind it. So I look for people who are charged up about the business, not just charged up about the idea and seek a big title, because that comes later. Your direct reports say you are a plainspoken, execution-focused guy. It’s true, I am focused on execution. I’m a goal setter, always was, personally and professionally. I’m 64 and I still have my own set of personal goals, and update them on a regular basis. For example, I’m not obsessed about it but I have physical workout goals, and when I don’t record in my diary what my workout was, when I miss a day, I feel that I’m off track. I feel the same about my professional goals for the organization, for myself as CEO and the goals for the board. It’s about continuous improvement and I expect the same from all the key players at McDonald’s. What continuous improvement goals do you set for yourself? Other than my golf game and my physical, I expect to be a better CEO than I was the previous year. I’m a learning kind of person, and we are a learning company. If you make a point to learn and question, you’ll be a better CEO even if the results are not the same or better. There are things one can’t control.I’m absolutely confident in our business model and our processes and protocols around our planning, innovation and menu management. However, I don’t know what’s going to happen in, say, currencies, commodities or other things we can’t control. Do you dismiss the idea that McDonald’s recent good fortune is a result of people trading down in a recession? Absolutely. We’d be doing even better today if the economy were in better shape, because of our deep penetration and the fact that we access 95 percent of the purchasing power of the world. Some say our dollar menu is a big reason people are coming to our restaurants, but that may account for 13 or 14 percent at most. This overlooks how we’ve changed the menu. For example, when some pointed to McDonald’s as contributing to the social problem of obesity, we totally redid our menu offerings, adding more fruit, vegetables, chicken and other items that have very low fat. Where else can you get a premium salad, which would cost eight bucks somewhere else, and have a coffee or drink for as little as five bucks? Are you encouraged or discouraged by the stimulus plan? Is it going to have much effect on your business? I am encouraged by the stimulus plan to the extent that at least something is being done. Won’t Obama’s tax hike on individuals earning more than $250,000 hit your franchisees hardest? It’s hard to say. Franchisees also face other issues, such as minimum wage levels, high taxes in various states and the way states go about administering regulations. We also worry about government policies that affect the dollar or commodities prices that could impact the buying power of our supply chain. I am very disappointed in the lack of leadership and accountability in various institutions, both in America and in the world, today. Political and business institutions equally. I suppose I am just as disappointed as everybody else and because of that, I think the solutions themselves are not going to be simple, because it took a while for us to create these toxic assets that are burdening our financial system. What if Obama gave you a free hand to solve the problem? What would you do? I think I’d have everyone come to McDonald’s, order a $5 salad and a drink and think it over. Keep it simple. This is what happened: Everyone got way too creative in thinking of ways to make money. Compare that to what we do. We’re transparent and straightforward in terms of shareholder returns. We’re not greedy or aggressive in taking care of our constituents, including ourselves. As you close in on your fifth anniversary as CEO, what can we expect to see five years from today? I don’t know, but I do know whatever new development emerges, it will get picked up in our consumer insights, it will get picked up in our processes, it will be something that we will develop because we are paying attention to our customers in our restaurants and we will know how to adapt it. For example, when I began as CEO, I think we were selling about $2 billion worth of chicken in the U.S. and today it’s almost $6 billion. That decision to move away from deli and put our bets on other things that make a difference demonstrates that our leadership strategies and our planning yield significant results. It’s not just coming up with the idea-I get letters every day with new ideas-like a sanitary hand wash. It’s the scalable ideas that we can execute that make the difference. So wherever we are in five years, we’ll be better than we are today. We will be more relevant to our customers because we understand that with the blogosphere it’s a 24/7 consumer environment. MySpace has more hits on a daily basis than the entire population. People can tune you in and they can tune you out, and you’ve got to be able to adjust accordingly. We’ll have better leaders and better restaurants. In ultimately choosing McDonald’s CEO Jim Skinner as the honoree for 2009 Chief Executive of the Year, members of the selection committee summed up their thinking.